In the twelfth century King Lalibela of Roha was poisoned by his brother-in-law. He was taken to heaven by God where he saw a grouping of rock-hewn churches which God commanded him to recreate as a new Jerusalem in Roha. When he recovered, Lalibela did just that, excavating directly from the rock a cluster of monolithic structures. 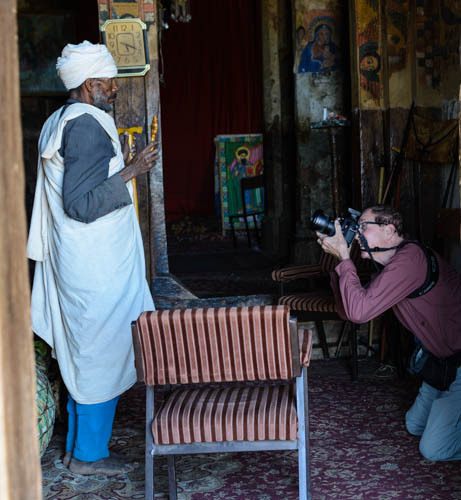 The churches of Lalibela are set in the stunning high desert of northern Ethiopia. We visited the main eight of them in one day, climbing up to the site, then down to each church where we took off our shoes and walked around interiors that were almost one thousand years old yet still in active use, populated by Orthodox priests and pilgrims. They were all built in the three-part Orthodox arrangement. The first area is for the drummer. Drumming is central to the service: the two sides of the drum represent the old and new testament. The drummer sways as he plays to imitate the walking of Christ carrying the cross, and inside the drum a pebble rolls back and forth as he sways, representing the casting of lots by the soldiers at the Passion. The central portion of the church is for the worshipers, and the third is the sanctuary. The frescoes, windows and paintings of each church were different, each the story of the saint for which it was named. It was a difficult day. We were all still in the grip of jet lag, out of breath from the altitude climbing, and in pain from sore feet, Maynard, Jim and Ginny struggled to find enough light to take photos of the beautiful priests and enough distance to capture the church exteriors, often adopting creative positioning. Maynard’s patience with churches is limited at best, and he began to pine for some baskets he had seen on the drive into town. 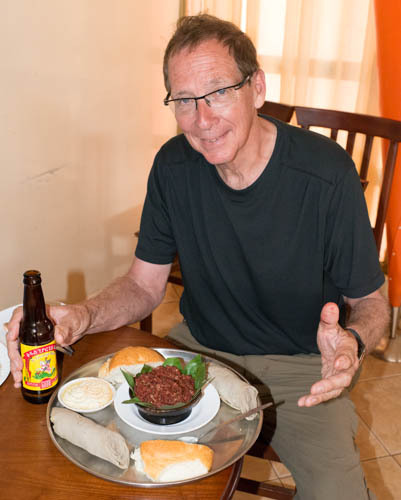 We had a challenge to keep him to the program, but he found his reward the next day as we left town to fly to Axum. He saw his basket shop and bought a beautiful multi-colored treasure for Ginny to carry for the next twenty days. Have you been able to follow the news? French troops kicked the Islamists out of Timbuktu a few days ago and the Wolverines are currently rated #1 in NCAA basketball.